This is the industry's most in depth guide to frame rates in video surveillance. As a precursor, you need to know the speed of objects, most typically people. The faster a person moves, the more likely you are to miss an action. You know the 'speed' of frame rate - 1 frame per second, 10 frames per second, 30, etc., but how many frames do you need for reliable capture? Here's how fast people move. For example, if you only have 1 frame per second, a person can easily move 4 to 16 feet in that time frame. We need to keep this in mind when evaluating frame rate selection. What speed do people move at and how does that compare to frame rates. Walking: What risks do you have capturing a person walking at 1, 10 and 30fps. Running: What do you have capturing a person running at 1, 10 and 30fps. Head Turning: How many more clear head shots do you get of a person at 1, 10 and 30fps. Playing Cards: What do you miss capturing card dealing at 1, 10 and 30fps. Shutter speed vs Frame Rate: How are these two related? Bandwidth vs Frame Rate: How much does bandwidth rise with increases in frame rate? Average Frame Rates used: What is the industry average? As our subject walks through the FOV, we view how far he moves from one frame to the next. In 30 and 10 fps streams, he does not complete a full stride. However, in the 1fps example, he has progressed ~4' between frames, which falls in line with our measured walking speed of ~4' a second. With our subject sprinting through the FOV, the 30 fps stream still catches him mid stride, while in the 10 fps stream, he has traveled ~1' between frames. In the 1 fps example, only one frame of the subject is captured, with him clearing the rest of the FOV between frames, with only his back foot visible in the second frame. Trying to get a clear face shot can be difficult when people move because they naturally shift their head frequently. In this demonstration, we had the subject shake their head back and forth walking down a hallway to show the difference frame rate plays. Notice, at 1fps, only a single clear head shot is captured, but at 10fps, you get many more. Finally, at 30fps, you may get one or two more, but it is not much of an improvement. In this test, our subject dealt a series of playing cards from ace to five with the camera set to default shutter speed (1/30). In the 30 and 10 fps examples, we can see each card as it is removed from the top of the deck and placed on the table. However, in the 1 fps example, we see only the cards appearing on the table, not the motions of the dealer, as frame rate is too low. Frame rate does not cause blurring. This is a misconception. The camera's automatic shutter speed control does. Dealing cards ace through 5 again, we raised the camera's minimum shutter speed to 1/4000 of a second. The image below compares the motion blur in the dealers hand and card, with the 2 card much more easily legible in the fast shutter speed example. 1/4000s shutter speed completely eliminated all traces of motion blur. 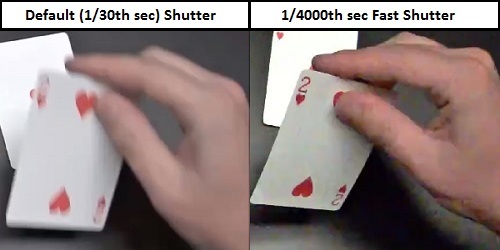 1/1000 and 1/2000 of a second shutter speeds significantly reduces blur, but it was still noticeable around the dealers fingers and edges of the cards when looking at the recordings frame-by-frame. If you have blurring, you have shutter speed configuration problem, not a frame rate one. On the other side, sometimes users want or camera manufacturers default their maximum shutter to a rate slower than the frame rate (e.g., a 1/4s shutter for a 1/30s camera). Not only does this cause blurring of moving objects, you lose frames. Key lesson: The frame rate per second can never be higher than the number of exposures per second. If you have a 1/4s shutter, the shutter / exposure only open and closes 4 times per second (i.e., 1/4s + 1/4s + 14/s + 1/4s = 1s). Since this only happens 4 times, you can only have 4 frames in that second. Some manufacturers fake frames with slow shutter, simply copying the same frame over and over again. For example, if you have 1/15s shutter, you can only have 15 exposures and, therefore, 15 frames. To make it seem like you have 30 frames, each frame can be sent twice in a row. Be careful with slow shutter. Beyond blur, you can either lose frames or waste storage. Frame rate impacts bandwidth, but for modern codecs, like H.264, it is less than linear. So if you increase frame rate by 10x, the increase in bandwidth is likely to be far less, often only 3 to 5 times more bandwidth. This is something we see mistaken regularly in the industry. The reason for this is inter-frame compression, that reduces bandwidth needs for parts of scenes that remain the same across frames (for more on inter and intra frame compression, see our CODEC tutorial). These measurements were done with 1 I frame per second, the most common setting in professional video surveillance (for more on this, see: Test: H.264 I vs P Frame Impact). For more on this, see our reports testing bandwidth vs frame rate and 30 vs 60 fps. Average industry frame rate is ~8-10fps, reflecting that this level provides enough frames to capture most actions granularly while minimizing storage costs. As show above, going from 10fps to 30fps can double storage costs but only marginally improve details captured. 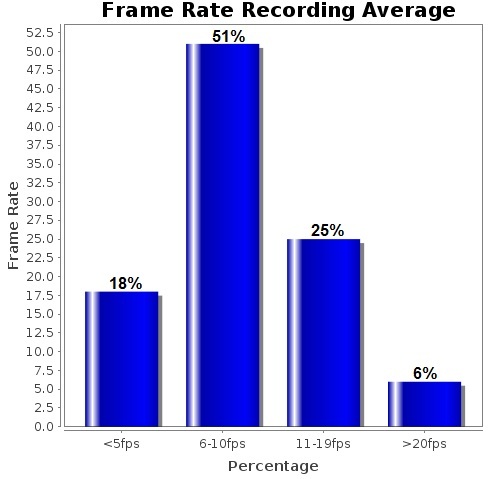 For more commentary on why integrators choose the frame rates hey do, see the Average Frame Rate Used for Recording report. For this test we used an Axis Q1604 (firmware version 5.50.3) with three streams (30/10/1) recorded by ExacqVision 6.2.7.63216. To see for yourself, download the 8 video samples.